Meet Mission Athlete Partner Amanda Beard: Olympic Swimmer, Water Safety and Wildlife Advocate, Model, TV Personality, Mom. Amanda is a seven-time Olympic medalist (two gold, four silver, one bronze), five-time U.S. national champion and an American record holder in the 200-meter breaststroke. Beard's successes have earned her the American Swimmer of the Year Award twice. She has won a total of twenty-one medals in major international competition, five gold, thirteen silver, and three bronze spanning the Olympics, the World Championships, the Pan Pacific Championships, and the Summer Universiade. Amanda has also enjoyed a career in front of the camera, as a model, spokesperson and TV corespondent. Though she's well known for her many accomplishments in the world of competitive swimming and as a model, she's also known for championing the conservation of endangered marine life. Amanda has also teamed up with the World Waterpark Association to raise awareness of water safety and responsible sun exposure through a series of public service announcements. "Water safety is incredibly important," says Beard. "I have a son at home, and we have a pool of course. At 6-months old I got him into swim classes. I want him to know how to swim as a life skill. Everyone should know how to swim for their own safety and the safety of people around them in the water, and I want to support that." Amanda is married to photographer Sacha Brown. In 2009, Beard gave birth to their first child, a boy named Blaise Ray Brown. "The fun thing about being a mom is that no matter what is going on in the pool, or if you have a bad workout, I get to go home and see his smiling face. He runs and gives me a hug and I could care less about what just happened. It's a new chapter in my life, and I'm really enjoying it." 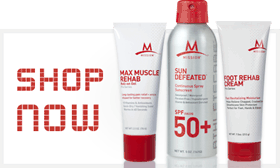 Amanda's favorite Mission Athletecare™ products include Skinny Tone Ultra-Firming Cream, sunscreen, and her signature Organic Strawberry lip balm. Amanda is gearing up for the 2012 Olympics. You can follow her online on Twitter.